There are a few quintessential Thanksgiving dinner items. A Thanksgiving dinner isn’t complete without a glistening turkey, creamy mashed potatoes, and a sweet pie to top off the evening. But no Thanksgiving meal would ever be truly whole without…you guessed it! Stuffing! This November classic actually dates back to the Roman Empire, where stuffings were made using chicken, rabbit, pork, and dormouse. The food has traveled across nations and centuries, but it remains a family favorite that no proper Thanksgiving dinner can do without. If you’re looking for a new stuffing recipe to try, give these two a shot. These tried and true recipes are sure to wow everything at your dinner party and have them begging for seconds. Preheat the oven to 350 and butter a 9-inch by 13-inch baking dish. In a large skillet set over medium-high heat, melt the butter. Add the celery and onions and cook, stirring, until fragrant and softened, about 5 minutes. Stir in the parsley, sage, thyme, salt, and pepper and cook for one more minute. Add the chicken broth and scrape up any brown bits that have formed on the bottom of the skillet, cooking for an additional minute. Remove from the heat and cool slightly. In a large bowl, combine the cooled mixture with the stuffing and beaten eggs and mix well. Transfer the mixture to the prepared baking dish. Bake until golden brown on top, 30 to 35 minutes. Let cool for 5 to 10 minutes. Top with additional parsley and serve! Preheat the oven to 350 and grease two 12-cup mini-muffin pans with cooking spray. On a baking sheet, toss the bread with two tablespoons of the oil; season with salt and pepper. Bake for about 10 minutes, until toasted. Transfer the croutons to a bowl. Meanwhile, in a large skillet, melt the butter in the remaining two tablespoons of oil. Add the onion and celery and cook over moderately high heat, stirring occasionally until golden, about 5 minutes. Add the sausage, garlic, and sage and cook, stirring and breaking up the meat, until no trace of pink remains, 5 minutes. Mix the sausage, apple, eggs, and broth into the croutons; season with salt and pepper. Let stand for 5 minutes. Share your favorite stuffing recipes with us in the comments! 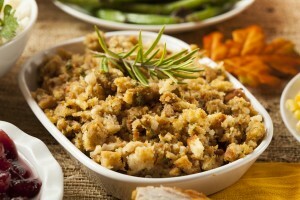 What unique ingredient are you trying to cook into your stuffing?